An American pilot crash lands in the desert and takes refuge in the very camp he was supposed to bomb. Hallucinating palm trees and worrying about dehydrating to death isn’t what Major Ellie expected from this mission. Still, it’s an improvement on the constant squabbles with his wife back home. In the camp, teenager Momo’s money-making schemes are failing. His brother left for his first day at work and never returned, his parents are at each other’s throats, his dog is having a very bad day, and an aid worker has shown up wanting to research him for her book on the Teenage Muslim Mind. Major Ellie crashes his sixty-five-million dollar jet in the desert near the refugee camp he was supposed to bomb. It’s not really a high priority target, but Ellie was thrown a bone by his commander to get a proper mission before his job as a ‘zoomie’ is replaced by sticky-keyboarded drone pilots. Sixty-five-million in hardware doesn’t leave much room to pay for a survival kit, however, and soon Ellie has nibbled down his last energy bar and is resisting the allure of oases and having nightmares about his wife. Dehydrated and hallucinating, Ellie is saved by Momo, a young refugee from the camp. Well, actually, Ellie is saved by Momo’s dog Mutt, who, along with Ellie and Momo, narrates the novel. Weird, huh? Anyway, Momo hates Westerners because when his brother went to work for them he disappeared and never came back. Mother Dear and Father Dear have been no help at all, so it’s been Momo leading the search to find Bro Ali. But despite his skills and understanding of Western capitalism, Momo’s business plans are failing. Maybe the young aid worker wanting to research Momo for her thesis on the ‘teenage Muslim mind’ can be of use? Momo can’t avoid seeing the irony of being bombed by a people who then seek to council him about grief and loss. 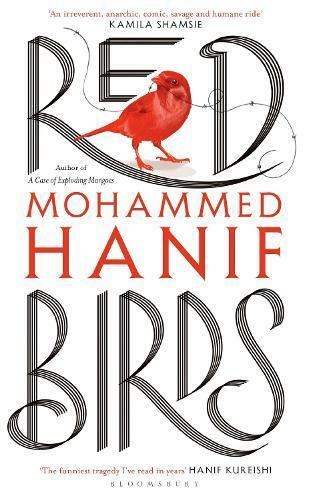 Red Birds is a darkly funny, irreverent story of a young life in a world ruled by war-for-war’s-sake and total bureaucracy, and in which the insidious power of the things we hate becomes the very thing that drive us. Told with deadpan humour, you’ll find yourself stifling an audible giggle at the absurdity of contemporary conflict. Michael McLoughlin works as a bookseller at Readings Carlton.